Debate rages on over SELMA, Anna DuVernay's thoughtful and rather beautiful account of the 1965 Freedom March from Selma to Montgomery. Those defending the legacy of Lyndon Baines Johnson have decried the film's portrayal of LBJ as a nemesis of Martin Luther King and an obstacle to the Civil Rights movement, in their eyes a significant distortion of history. There is a certain villainy about DuVernay's LBJ, as portrayed by Tom Wilkinson. With an unwieldy Texas accent, Wilkinson's LBJ berates King for insisting he press for a voting rights bill now, rather than defer it in favor of his top legislative priority, the War on Poverty. The angry, adversarial tone of their Oval Office meetings seems a bit implausible, and the film's implication that Johnson was complicit in J. Edgar Hoover's contemptible surveillance and vindictive smear campaign against King seems a bridge too far – even though LBJ was a notoriously crude man and is suspected of having done things far worse than opposing King. Hoover (played in the film by Dylan Baker) was a dangerous and powerful psychopath, and the film uses as a narrative device data from FBI surveillance of King's movements. Johnson and King did clash, but it was over the Vietnam War, after the events depicted in the film. The film may be a bit unfair to Johnson, but DuVernay says that was not her intention. “I think this has all been a bit overblown, especially because this film is not about LBJ,” she told Terry Gross on NPR's "Fresh Air." “This is a film that's about the people of Selma and the black leadership of Selma and the allies who came to the aid of black people who were being terrorized in Selma. And one of those allies turned out to be, eventually, LBJ," whose speech announcing the Voting Rights Act, in which he quotes "We Shall Overcome," crowns the film triumphantly. The controversy over the LBJ portrayal points to something that tends to afflict movies about race – it's always about the white people. THE HELP, LONG WALK TO FREEDOM, MISSISSIPPI BURNING, LINCOLN – so often they are about white people who helped blacks overcome racism. 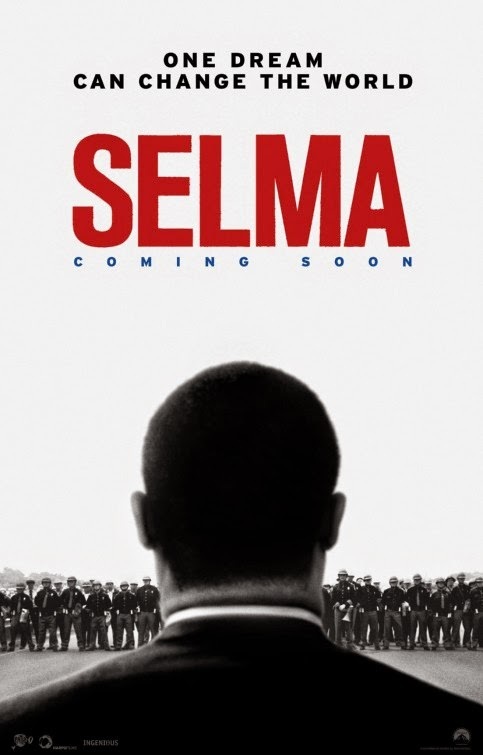 But SELMA focuses on the movement – the Student Nonviolent Coordinating Committee workers who had started the hard work of registering voters in Selma years before King's Southern Christian Leadership Conference arrived, and the tensions and conflicts within and between those groups. DuVernay also determined that her film would not compress people into “composite” characters, so a great deal of care was taken to make every person involved a full character. So we can learn about and feel the pain of people like activist Annie Lee Cooper (Oprah Winfrey, whose company produced the film), the civil rights worker who was beaten outside the Dallas County Courthouse after standing for hours in line to register to vote (Oprah is excellent in a scene where she is made to take a "poll test"). Jimmie Lee Jackson (Keith Stanfield), shot to death by an Alabama State Trooper after taking refuge in a restaurant with his mother and 83-year-old grandfather, Cager Lee (Henry Lee Sanders), heartbroken at the sight of his grandson's murdered body at the morgue. Amelia Boynton (Lorraine Toussaint), beaten and left for dead when troops, under orders from Alabama Gov. George Wallace and armed with guns, billy clubs, cattle prods, tear gas and masks, backed by more men on horseback, advanced on the marchers and brutally assaulted them. (Amelia Boynton Robinson is now 103 and was able to watch Selma.) James Reeb, a Boston minister who who answered MLK's call to clergy to join the march in Selma, clubbed to death by white segregationists. A great many of the movement's important players are depicted: Andrew Young, John Lewis, James Bevel, Diane Nash, Bayard Rustin, Rev. Hosea Williams, James Orange. Ralph Abernathy. Not everyone gets an entirely fair shake; Malcolm X (Nigel Thatch) is portrayed, oddly, as making King jealous when he meets with Coretta while her husband is in jail. This New Republic essay complains that the film ignores the radical grassroots origins of the movement in favor of a “top-down narrative” that “enshrines the charismatic male leadership of the movement.” The writer may be expecting too much of a Hollywood film; this one seems to me to give a fuller picture of the Civil Rights Movement than we usually see in fictional movies. Quiet scenes of dialogue alternate with panoramas of explosive violence, as shocking today as it was 50 years ago. Bradford Young's chiaroscuro cinematography is evocative; his shots frame two speakers with one face in partial shadow The staging of dramatic events like the Birmingham church bombing that claimed the lives of four little girls and Bloody Sunday as marchers are savagely beaten on the Edmund Pettus Bridge (named for a Confederate general and Ku Klux Klan leader) is breathtaking. The interspersing of real documentary footage with the dramatic re-creations is deftly handled. Historical films always generate controversy. They can never fully capture the reality of events. DuVernay's film, with its depth of feeling, skillful handling, and high level of talent, and despite a few “off” notes, lives up to its considerable ambition. It is sobering to realize that many of the battles that were fought a half-century ago (and well before that) are still being fought, as we march and protest in our own time for justice for Eric Garner, Michael Brown, Trayvon Martin, Tamir Rice, Ramarley Graham and other victims of racial hatred and murder. 3 1/2 out of 4 stars.